This stunning �Renoir� ICI home has it all. Named after one of the great Masters, this home really is a masterpiece in its own right. A true gem in construction and design located in an upscale gated community. It starts with the appealing front: the stacked stone fa�ade, the walkway made from pavers, the landscaping, the art-deco glass door, it�s all just so beautiful. When you enter this home you will find at your left the library with a queen size Murphy bed and bookshelves in cherry finish. 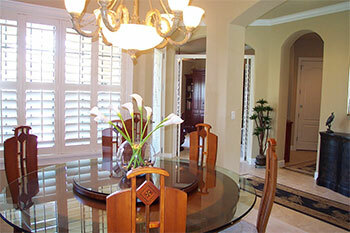 To the right is the formal dining room . An arched opening takes you to the living room, kitchen and breakfast nook. 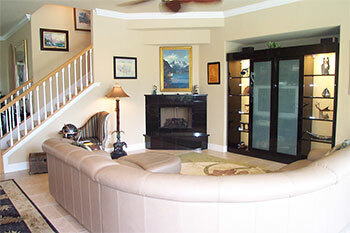 The living room has a granite fireplace (gas and remote controlled) and alcove. 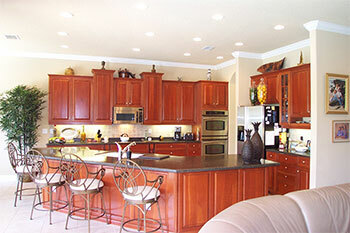 The open kitchen has plenty of cabinets in a beautiful cherry finish with matching moldings. Most cabinets have pull-out drawers instead of shelves. The countertops are black, solid surface material. The kitchen has a large island counter with molded-in sink. All appliances are stainless steel. Behind the kitchen is a large walk-in pantry and a butler area with glass block window. Kitchen has a breakfast nook with bay window overlooking the spectacular pool, beautifully landscaped backyard, lake and nature preserve.The screened-in pool area has a spa and waterfall and is finished with the same stacked stone as the outside of the house. The pool and spa have a self-cleaning system in floor, seats and steps. The pool has tiled dolphins on the bottom and tile around the edge. 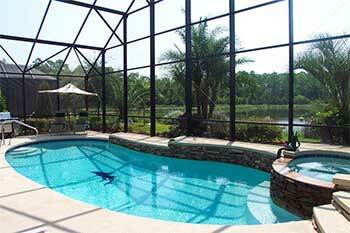 The pool and spa have propane heat and also a heat pump. Both pool and spa have alternating color lights. 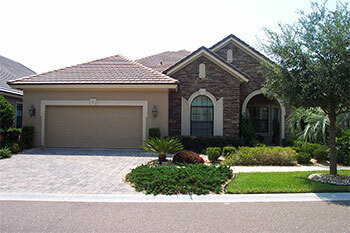 The covered portion of lanai (10�x20�) has a granite wet bar with refrigerator and ceiling fan. The ground floor also features the 2-car garage, laundry room, half bath, guest bedroom with large closet, guest bathroom with tiled shower and master bedroom with master bath overlooking the pool area. The master bath has a garden tub, enclosed shower with handicap bar, large double sink, cherry glazed base cabinets and ceiling high mirrors. 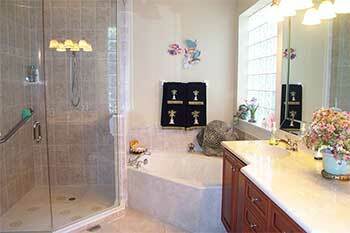 Upstairs is a bonus room with a king size Murphy bed, wet bar and refrigerator and bathroom with tiled shower. Sliding glass doors open up to the balcony with magnificent views of pool area! Upstairs has a separate A/C unit. 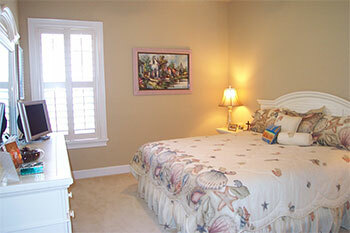 Some more facts: Plantation shutters and fans throughout, alarm system, sprinkler system. Some furnishings may be for sale. There is excellent golfing: the golf course is an Arnold Palmer signature course. 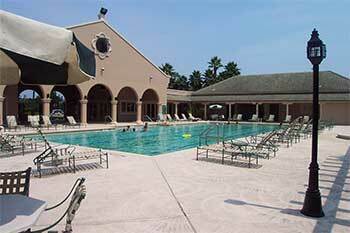 Amenities include: 2 pools, 2 club houses, golfing, playgrounds, restaurants etc.